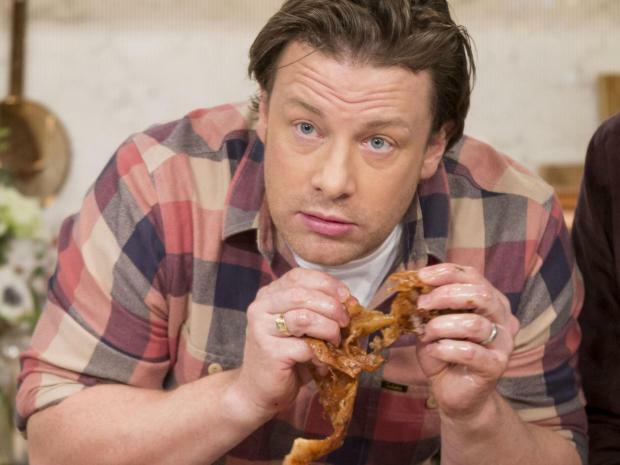 Celebrity chef Jamie Oliver is really losing his patience with anti-meat activists, who he says ‘hate’ him ... and it seems the feeling is mutual. The British cook claims vegans “annoy” him because they’ve disrupted diners at his restaurants, trying to convince customers not to eat animals. “They hate me because we do stories about higher welfare meat, which I am deeply passionate about, but for them it is on or off — there ain’t no stepping stones, whereas I’m all about stepping stones,” Oliver told Britain’s Sunday Times magazine. Oliver claimed one of his restaurants was targeted by “20 scruffy, weird-looking fellas putting iPads of slaughtered animals in front of kids having spaghetti bolognese on a Saturday lunch”. His restaurant in Bristol was targeted by vegan activists in March, the Daily Mail reports, after they took offence to comments Oliver made about so-called “happy milk”. “I have done more to push plant-based diets than any of them,” he said. Oliver boasts that most of his books contain at least 65 per cent vegetarian recipes, and he has long supported the vegan lifestyle. To be fair, Oliver doesn’t have nearly the same level of disdain for vegans like other food personalities such as Anthony Bourdain or the Italian chef who came under fire last year for saying he’d kill all vegans.